PHP and MySQL (or its fork, MariaDB) are two of today’s most popular, open-source tools for server-side web programming. And with this book, you’ll learn right from the start how to use them together, the way the pros do. In fact, you’ll create a database-driven website that implements the MVC pattern in the first 6 chapters! Then, the rest of the chapters show you how to build out your PHP and MySQL skills to the professional level, using today's best practices. Along with the great organization, ease of learning, and thorough coverage of the technologies and programming practices, this book is simply a pleasure to read. Any developer/techie/geek should enjoy it. A solid 5-star rating all the way." This book is for anyone who wants to learn how to build and maintain websites that use PHP and MySQL (or its drop-in replacement, MariaDB). If you have some programming experience, you’ll move through this book more quickly. But because of its self-paced approach, this book also works for beginning programmers. The only prerequisite for this book is that you have some elementary HTML and CSS skills. If you don’t have these skills or if you want to add to your skill set, you can read Murach’s HTML5 and CSS3 (3rd Edition). This book gets you started with PHP and MySQL as quickly as possible and then builds out your skills in a professional way. To make that manageable, this book is divided into four sections. This section is designed to get you off to a fast start whether or not you have any programming experience. So chapter 2 presents a complete subset of PHP; chapter 3 shows you how to use a MySQL database; chapter 4 shows you how to develop database applications with PHP; chapter 5 shows how to structure the code in your applications by using the MVC pattern; and chapter 6 shows you how to test and debug your web applications. These are the skills you need to ensure that your web applications come across as trustworthy, reliable, and fully professional to your visitors. Then, the last chapter in this section shows how to put all your skills together in an e-commerce website. Like all our books, this one has features that you won’t find in competing books. That’s why we believe you’ll learn faster and better with our book than with any other. Here are just a few of those features. Because section 1 presents a complete subset of PHP and MySQL in just 6 chapters and 206 pages, you’re ready for productive work much faster than you are when you use competing books. Because the next three sections present all of the other skills that you need for developing web applications at a professional level, you can go from beginner to professional in a single book. The exercises at the end of each chapter let you practice what you’ve just learned. However, to make sure you get the most practice in the least time, these exercises start from applications that you can download from our website. This download also includes the solutions to the exercises so you can compare your solutions with the model solutions. To show you how all of the pieces of a PHP and MySQL application work together, this book presents the HTML, PHP, and MySQL code for 16 applications. As we see it, the only way to master PHP programming is to study the code in applications like these...but this is a missing ingredient in other books. We’ve added coverage of PHP 7 enhancements like type definitions, improved error handling, new operators, and new functions. Coverage of sending email no longer uses PEAR Mail. Instead, it uses PHPMailer, probably the world’s most popular library for sending email with PHP! We’ve dropped coverage of the cURL library because it’s no longer the best practice for accessing most websites. All code has been updated to conform to today’s best practices, especially when it comes to security. All three of these can be downloaded and installed for free in a single download called XAMPP. To edit your PHP code, you can use any text editor that you like. However, we recommend using an IDE (Integrated Development Environment) such as NetBeans that includes a text editor that’s designed for working with HTML, CSS, and PHP. Besides allowing you to edit your text files, NetBeans makes it easier to run your applications. It can work with Xdebug to help you debug your applications. And chapter 1 presents a short introduction that gets you started with it. To test any web application, you need multiple web browsers. To start, you can use the browser that comes with your computer: Internet Explorer or Edge for Windows systems and Safari for Macs. But we also recommend that you test your applications using Google Chrome and Mozilla Firefox, and both are available for free. To help you install these products, the appendixes provide the website addresses and procedures that you’ll need for Windows, Mac OS, and Linux systems. 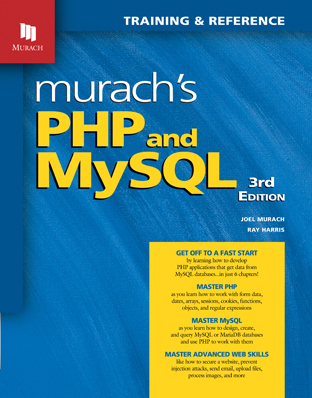 Murach’s MySQL (Second Edition) is the perfect companion book to our PHP book. This book expands on the MySQL material in our PHP book. It goes into more depth on subjects like querying, with more options and more examples. It goes into more breadth by covering new subjects, like how to use stored programs and do database administration tasks. And it’s the perfect MySQL desk reference. Murach’s HTML5 and CSS3 (Third Edition) is another book that every PHP developer should have. It will help you expand your HTML and CSS skills in a professional way whenever you have some extra time. It covers today’s best practices for using HTML5 and CSS3. And it’s the best on-the-job reference available for HTML and CSS. "Awesome book. Murach’s PHP and MySQL reads like a learning book but is structured in a way that makes it an excellent reference manual. The left side explanation/right side code orientation took me a little time to warm up to but is actually a much more clean layout and works much better when you are referencing." "Compared to the stack of other PHP/MySQL titles on the market, I found Murach to be one of the easiest and fastest books to teach the subject." "As a C# developer, I needed a book that would clear up the sometimes confusing syntax of PHP without requiring me to wade through a lot of concepts I already understood. This book does exactly that. Murach’s unique style of putting explanations on each left page and corresponding examples on each right page is ingeniously simple yet amazingly effective. The result is a very fast read. Also, the editing is superb. So far, I haven’t encountered any errors in the sample source code. Excellent book." "Along with the great organization, ease of learning, and thorough coverage of the technologies and programming practice, this book is simply a pleasure to read. Any developer/techie/geek should enjoy it. A solid 5-star rating all the way." "Without a doubt, this book qualifies itself as a very practical book on learning PHP in the shortest time. I would thoroughly recommend this book to all budding PHP web developers out there, including ASP.NET developers who wish to diversify into PHP." "Truly a Beginner to Pro book. All the topics I needed to learn to get productive fast, and presented in a nice logical sequence. Definitely an A+++." This chapter gives you the background that will get you off to a fast start with PHP. It explains how web programming with PHP works. It shows you all the code (HTML, CSS, and PHP) for a Product Discount application so you can see how all the pieces fit together. And it demonstrates the software tools you’ll use to create PHP applications. When you’re done, you’ll be ready to start in on the details of PHP programming. The appendixes in the book show how to install and use these files on Windows, Mac OS, and Linux systems.